I have been doing a job search the last 3 months. I had a job offer from Safeway ,$11 per hour and they do not give you benefits until you have been employed for 1 year and this Canadian company has a union,this must be one of the weakest unions in all of BC. I refused this offer and gave the HR person a piece of my mind about the minimum wage salary. I worked as a bakers assistant for 4 years when I was younger and they would not take my experience into account. The other job I applied for was as a ramp agent for Swissport at Vancouver airport.Full-time position at $11.50 per hour which is barely above minimum wage and no benefits until after 1 year. This multinational company also has a union,but it seems weak as well. I am a huge union supporter,however these 2 employers have their unions under their control.I did not even go for an interview after reading how horribly they treat their employees on online job review websites.My job search will continue until I can find a suitable position. As for the political part of this post,we have an election on May 9 in BC and I will be working hard for the BCNDP to take over power from the BC Liberals.I encourage everyone to get out and vote as voter apathy is a major problem as evidenced by what happened in the US election last November.Some major campaign promises by the NDP are raising the minimum wage to $15 per hour ,getting rid of union and corporate donations to political parties and $10 per day daycare for parents. Hello hockey fans,this post has been a long time coming and I am ecstatic to write about my favorite team winning the Stanley Cup.Here is a pic of the Hockey news cover,I bought it in Vancouver airport after landing there on July 16th.The Hockey Newses were hiding behind the cash register in the Hudson News in the airport,I wonder why? A brief review of the series they needed to win to get to the finals.The first series was against the hated Hab scum and went badly when after the first 2 games the Bruins were down 2 games to none.They then won 2 games in Montreal and came back to win a series in which they had been down 2-0 in the series for the first time in history and you knew this was a team of destiny or fate or whatever you want to call it.Nathan Horton scored the game winning goal in OT to win the series and would be a clutch performer for the Bruins until he was taken out by a cheap shot hit by Aaron Rome of the Canucks in the finals. The next series against the Flyers was payback time after the Bruins choked away a 3-0 series lead against the Flyers in the previous year’s playoffs.The sweep was sweet as the Bruins dominated the Flyers and their minor league goaltending,Chris Pronger did not play in the series but he might have won the Flyers one game at most if he had been in the lineup. The next series was versus the vastly improving Tampa Bay Lightning and I really enjoyed this series the most eventhough,it was very stressful going down to game 7 again in OT where Horton scored the game winning goal again to send the TD garden fans home happy again and dreaming of Lord Stanley’s Cup. The finals against the Canucks who were the President’s Cup champions in the regular season.I watched game 2 at my friend John’s house and we had a wager on the series with him as well as a few other people in Canada and Japan.Game 2 was pretty hard as the Bruins lost and were down 2-0 in the series after that and my friend Mark was whooping it up and saying the Cup was the Canucks.This pic shows a scrum in front of the Bruins net in game 2 I believe with the captain Chara defending his team’s honour!! !I almost forgot the important TSN turning point in game 2 Rome hit Horton with a dirty hit and was subsequently suspended for the rest of the series because of this hit. 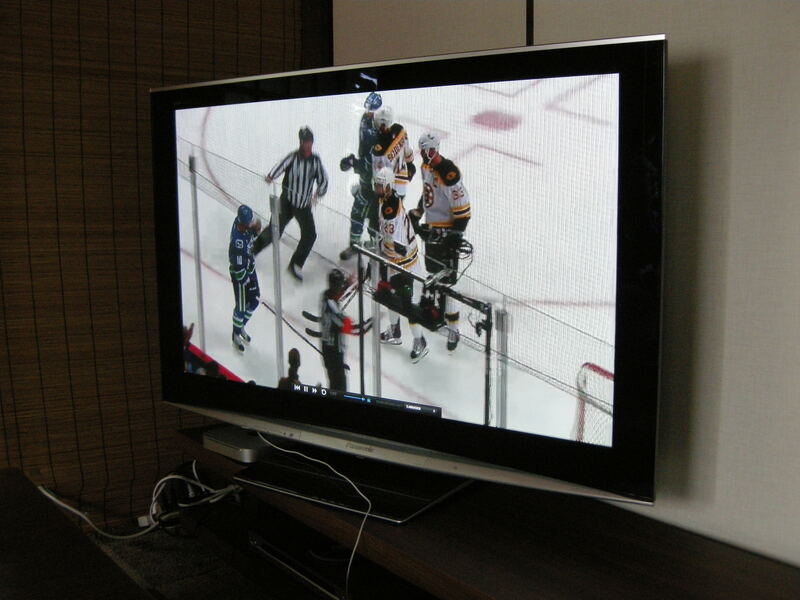 The Bruins then went home to Beantown and totally dominated and manhandled the Canucks in games 3 and 4. What time is it? It is 12 past Luongo was the joke after game 4 was finished. The Canucks didn’t give up without a fight and won game 5 with a shutout from Luongo who played well in Vancouver but totally choked in the TD garden.Brad Marchand took over game 6 and led the Bruins to a well earned 5-2 victory and set the table for a winner take all game 7. Game 7 Patrice Bergeron #37 in your program but number 1 in our hearts after his courageous comeback from a concussion in 2007 scored 2 goals and shutdown the Sedin sisters for one more time and the Cup was back home in Boston!!!! Then the partying began my friend Damian who had to work and couldn’t watch the game bought some Moet Chandon champagne and after he finished work and I finished work as I had to work in the afternoon after I watched the game in the morning.He wanted to watch the game again and my other friend Ross who is a Leafs fan watched the game together. 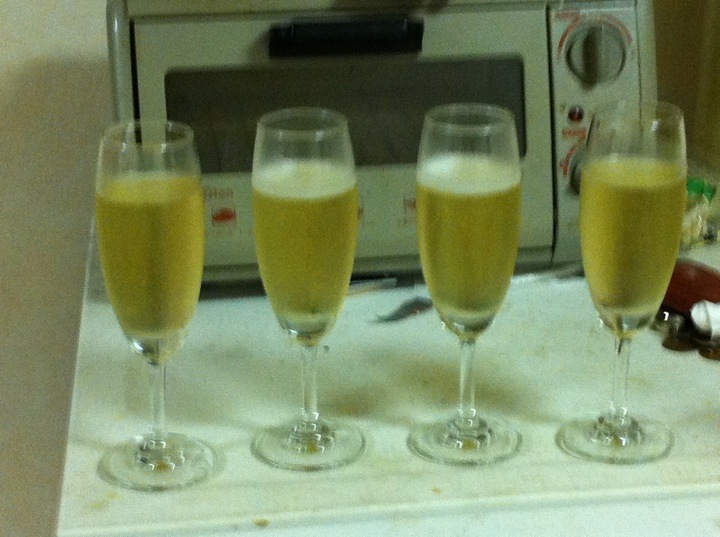 The next night on Friday I bought some more champagne at 2 Papas my friend’s bar and we had another toast to the Bruins sweeter than sweet Cup win and I shouted “We got the Cup”at the top of my lungs. 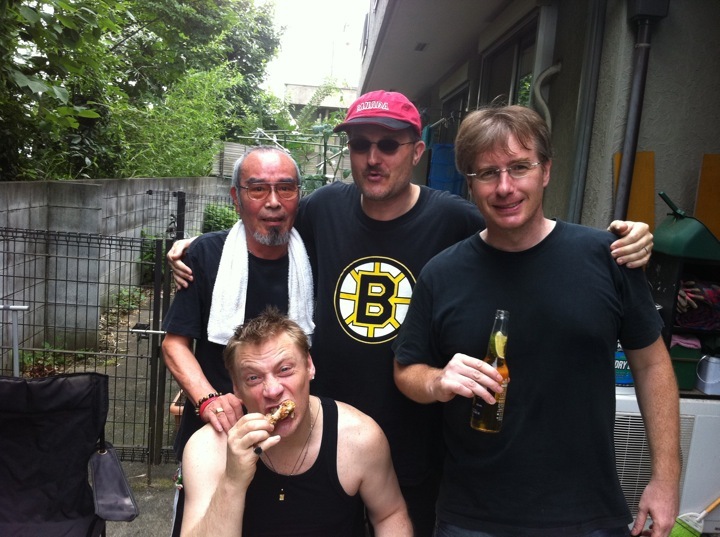 A few weeks later I had a Stanley Cup victory BBQ at my house and we only drank sparkling wine this time.Here is a pic of the boys at the BBQ!!!! 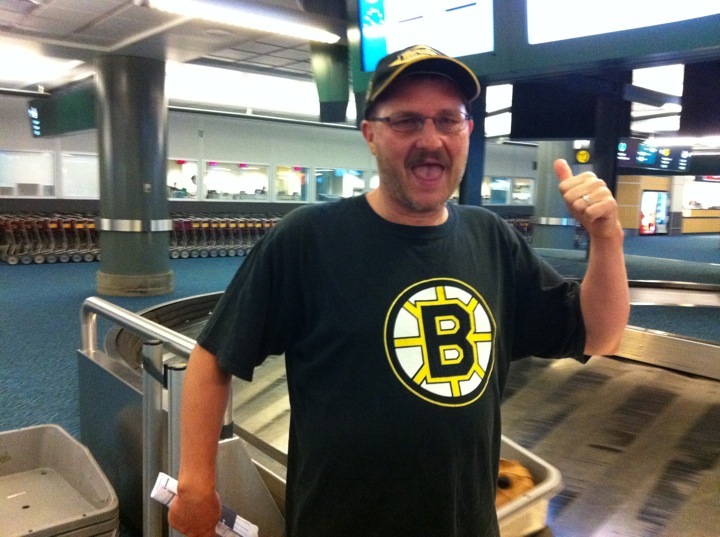 The last pic is in Vancouver airport when I passed through on my way to Calgary in July and wore my Bruins colours with pride. Well training camp starts this month for “the defending Stanley Cup champion Boston Bruins”,I love saying that anytime of the day or night!!! Hello hockey fans and everyone.This is usually a blog about hockey but 2 weeks ago almost to the minute the biggest quake to ever hit Japan shook the country to its core and devastated the northeastern coast because of a huge tsunami that slammed into the coast after the quake.I recommend everyone to donate to the Japanese Red Cross or other organizations that are helping the victims of the quake.My story started just after I stepped out of an office building in Kameido in the eastern area of Tokyo. I turned the corner and was walking towards the station when I saw an older woman kneeling on the ground and felt it was a little strange,but then I realized it was an earthquake and I watched as a 15 storey building was swaying side to side and people were standing around in a stunned silence.The quake lasted for 2 or 3 minutes but I am not sure of the exact length of the quake. 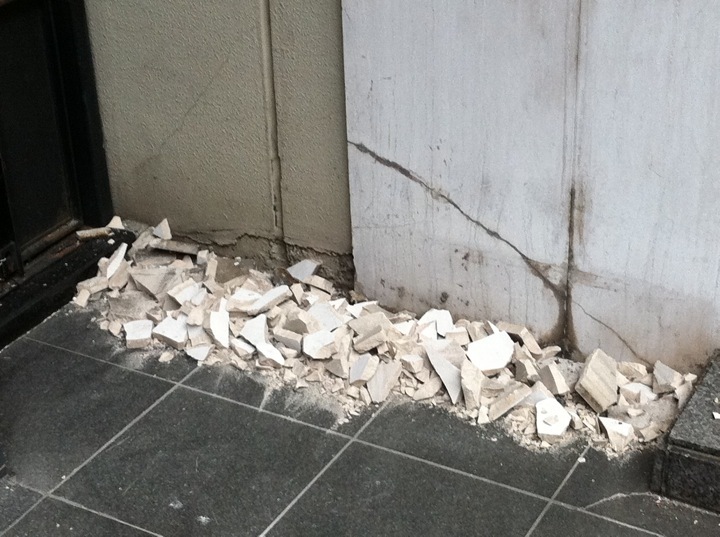 After it was finished I thought I should walk to my wife’s office to see if she was alright.All cell phone communications went down after the quake and email was sporadic. I took some pics along the way and there were many people just walking and standing around and trying to stay safe and some people had put on hardhats from the ofiices.Here is the first picture of an building. 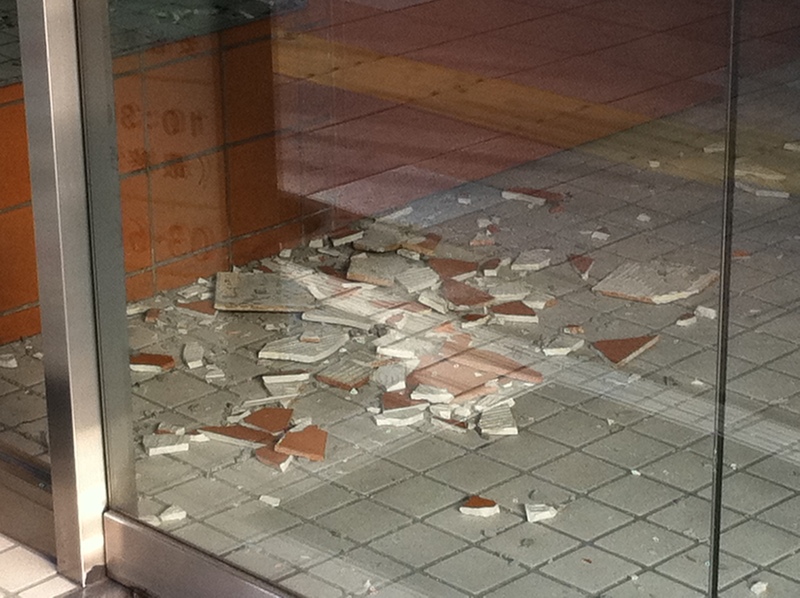 The next picture is some rubble beside an office building close to Miho’s office. 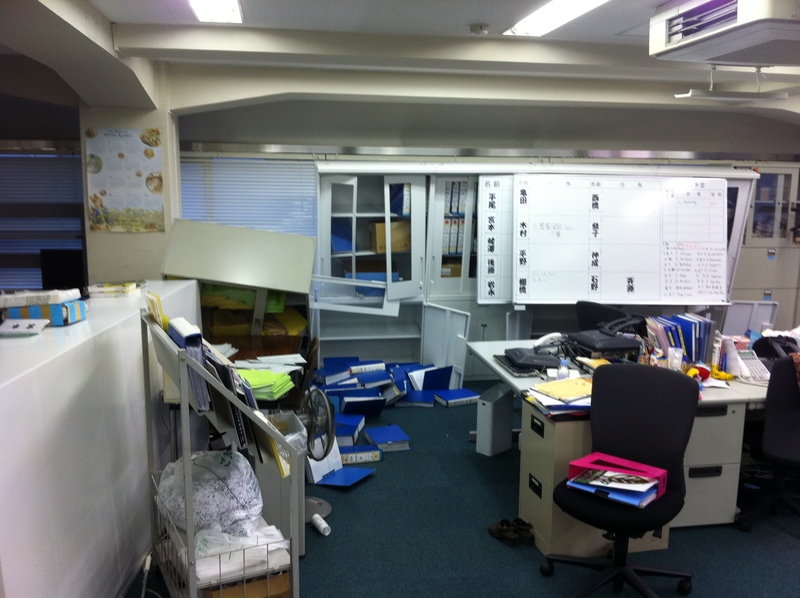 So I continued to walk and it took me about 90 minutes to get to Miho’s office and she was fine but she did have a hardhat and she had to evacuate her building for about an hour after the big quake. I told her I had to go to my own office to deliver some student evaluations and then I would come back and we could go home together.Here is a pic of a toppled bookcase in my office. toppled bookcase in my office. I got to my office and one staff member was still there but all the other people had went home and all classes were cancelled for Friday night.I bought some bottled water and some snacks which I ate in my office to try to calm myself down through the frequent aftershocks.I had to walk up 9 floors to get to my office and down the stairs again when I left. 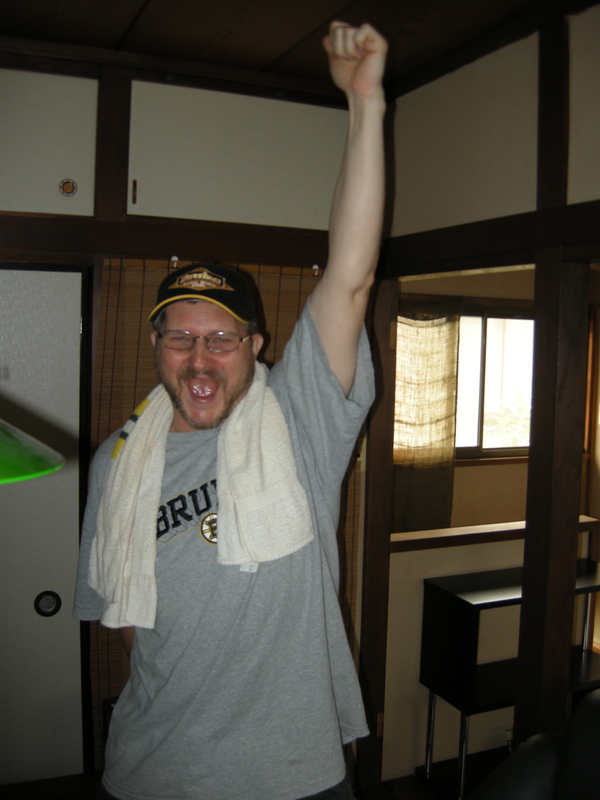 I then proceeded to walk back to my wife’s office after cracking open a beer and gulping it as I walked back to see Miho.I arrived and she was waiting for me in a park close to her office.She said we could stay at her office for the night,it was about 6 pm at this time.I said let’s walk home so I looked at the GPS on my iPhone and we were off. It looked to be about 25 kilometres. I was wearing deck shoes and Miho was wearing some boots more to come on this footwear later in the story.We set off and got close to Tokyo station which was really crowded with people as all the train had stopped after the quake. We got around Tokyo station then we headed towards the Imperial Palace and it was wall to wall people walking west to get home,I put on Miho’s white hardhat for protection and wore it all the way home.We managed to get on a major road route 20 going towards Shinjuku,I had one minor incident witha truck driver who was blocking crosswalk and I hit his mirror and knocked it to the ground but it didnt break and Miho apologized to him,but he said “Wait a minute “,but we just walked away.Miho did hand the mirror back to the truck driver.After that we just kept walking home we walked on the road sometimes and on the sidewalk sometimes as a mass exodus of humanity were trying to get home.We arrived in Shinjuku at about 8 pm and it took us about 30 minutes to continue heading west as there were so many people leaving from the mega train station.We walked along and found a discount store with some sneakers and Miho bought a pair for 20 bucks,but unfortunately I couldn’t find a pair that would fit me and by this time my feet were really starting to hurt.It took 3 days for my left foot to get back to normal and about 10 days for my right foot to get back to normal.Previous to buying the sneakers we went into to a restaurant to eat dinner but the wait was too long so we decided to keep going.We then turned onto Itsukaichi Street going to Kichijoji and we saw some buses going to Ogikubo station,it was about 10 oclock by this time so we popped into a local restaurant for dinner and met some other people that was also walking home to places further west than we were going.We watched the tsunami and earthquake updates on the TV and we were horrified by the pictures.Then we started walking again and finally got on a bus for Ogikubo station which was a lifesaver for my aching feet. Then we had to walk 2 more stations to get to Kichijoji and hopefully catch a taxi to our home station of Musashi Sakai. We arrived at Kichijoji and found a taxi that took us took our station and we hopped on our bikes and got home by 130 am.One last thing about this story I had went to the gym on this morning and worked out for about an hour so I calculated my workout to be about 9 and a half hours including all the walking. Hockey update the Bruins massacred the Hab scum today 7-0 to take a commanding 5 point lead over the Canadiens in the Northeast Division.There is a possibility that they could meet in the first round of the playoffs. Hockey Pool Jay the minister is in first place with 880 points John the loveable loser 2nd with 854,Scotty 824,newcomer Chris 817,me 780 and Brian the basement boy with 773 points.I will donate all the money from our pool to the Japanese Red Cross or Second Harvest for the earthquake victims in Northeastern Japan. Lastly Yahoo fantasy update. Kevin from Toronto who left Japan last year and must be cheering hard for his Leafs to make the playoffs has 41 points in first and I am in second with 40 points but I am running out of player options with 2 weeks remaining in the season ,Dave from Calgary is in 3rd with 36.5 points ,Thomas in 4th with 27.5 points John the loveable loser from Vancouver in 5th with 23 points and Brian the Chiba Canucks in last with 21 points.I hate to say it but I think Kevin will win. My only hope is if I take over the shorthanded points lead and pass him in the game winning goals category as well. 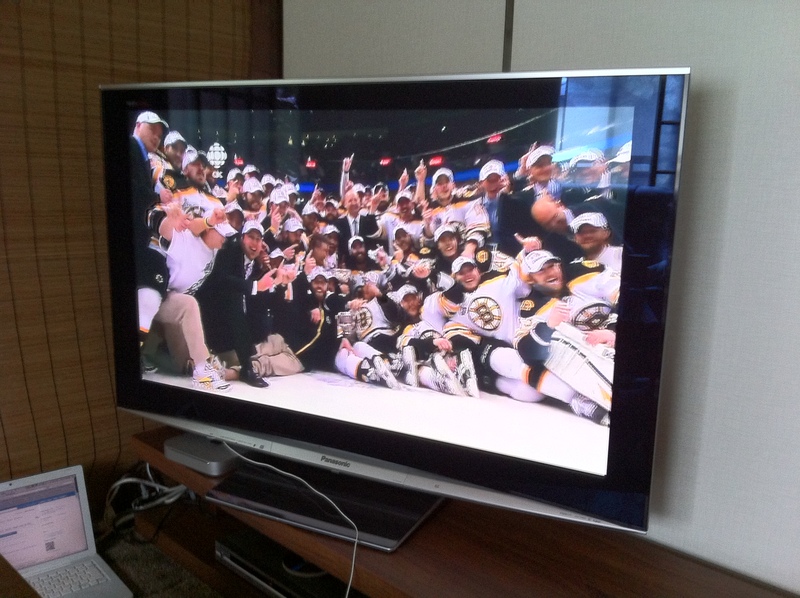 Well that is all for now,hockey seems very insignificant compared to the earthquake. My heart goes out to all people affected by the quake and tsunami and to all people who lost loved ones in this terible disaster. Bruins lose in round 2 in epic and historic fashion!!! Hello hockey fans,the mourning has begun for Bruins fans around the world and what a way to lose a series after being up 3-0 in the series to the Broad Street bullies from Philadelphia.Game 7 was a tale of 2 games,the first period that I missed because I was sleeping and woke up to the euphoria of a 3-1 lead after 1 period.The sad part of the last 2 periods where I didn’t see the Bruins score a goal and went down to defeat on a powerplay goal by Simon Gagne who was somewhat of a Bruins killer as he scored the game winning goal in OT in a very pivotal game 4.The Bruins join the infamous 4 in sports which have lost a series after leading it 3-0,these include the 1942 Detroit Red Wings,the 1975 Pittsburgh Penguins and the 2004 New York Yankees. My playoff beard was shaved off yesterday and the 2 following pics are the before and after shots. Hockey pool news, the bright point in the Bruins debacle is that I have pretty well won the playoff pool and 2 rounds are left in the playoffs.I am in first with 162 points Johnny RIP Canucks 123,Brian bet it all on the Canucks 120 points and Jay the minister with 109 points.I have 8 players left John has 4 Brian has 0 and Jay has 5 so he will definitely put Brian into last place. Late breaking news the Flyers just pounded the Canadiens in game 1 6-0 which I really liked due to my intense hatred of the Hab scum,my original prediction was Flyers in 7 but I think I will change it ti Flyers in 5!! Sharks in 6 is my other prediction eventhough the Hawks won game 1 today 2-1. World championship update,Team Canada has a 3 and 2 record after a 3-1 loss to Sweden today and have 1 game left before they have a quarterfinal game later in the week and hopefully they can get into the semifinals,but their main goalie is Chris Mason and the backups are unknown goalies and a major injuries to Ryan Smyth and Steven Stamkos will make it difficult for them to win the tournament. Anyways that is all for now,enjoy round 3 in the NHL playoffs and finally in basketball I am cheering for a Suns-Celtics finals and would really love to see Canadian bball legend Steve Nash get a championship ring this year before he retires from the NBA!!! 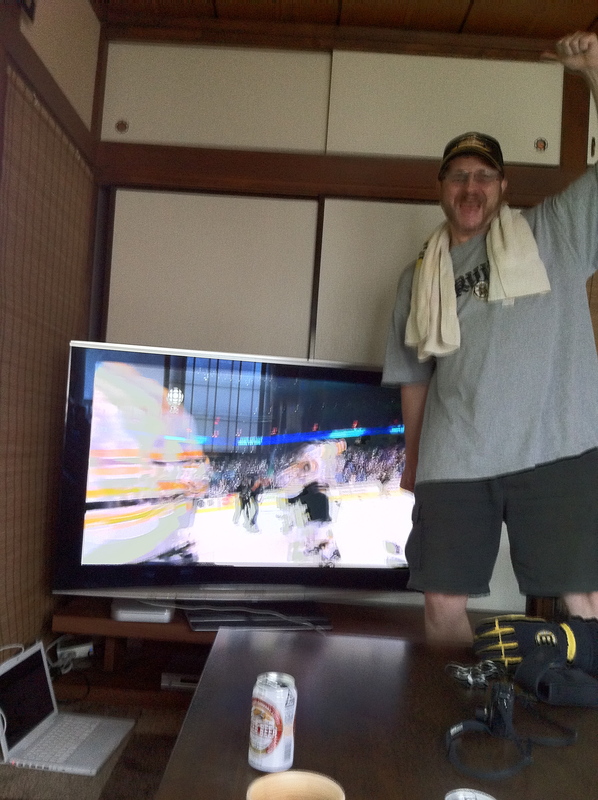 Crosby scores the golden goal in Vancouver!!!! 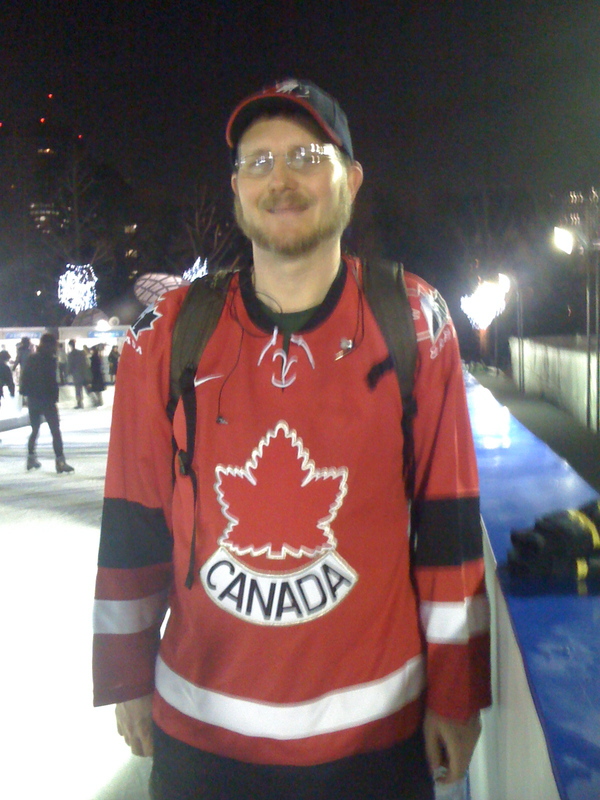 Hello hockey fans,happy St. Patrick’s Day from Japan ,I have a lot of stuff to talk about hockeywise today the most important being the Gold medal for Canada at the Vancouver Olympics,I watched the first 2 periods with my friends John,Sean,Burt and Robin at John’s place in Kichijoji and we were screaming our heads off with Canada leading 2-1 after 2.I had to leave for work after that which was a major bummer,John jinxed Team Canada by getting the bottle of champagne from the fridge with about a minute left in the game and Parise tied the score with 24 seconds left.I was waiting for my student to arrive and learned of the golden goal from the Score mobile app on my iPhone.I swear I would have smashed my phone on the ground if Canada had lost.Crosby you rock and are a Canadian hero forever and ever.Here is a picture of me at an outdoor rink in Tokyo 5 days before the big gold medal game. 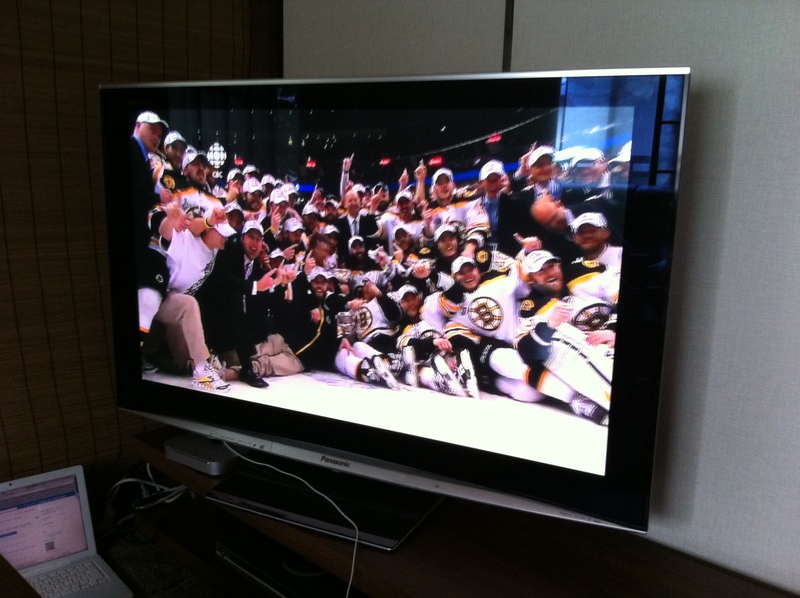 I finally had a chance to see the end of the game last Saturday night when NHK in Japan replayed the gold medal game not as much screaming as 2 weeks ago but it still felt good. On to the Asia league,the playoffs have started as they changed the playoff format this year with only the top 4 teams qualifying,Anyang Halla won the league title and is battling against High1 who finished 4th in an all Korea semifinal,Anyang presently has a 2-1 lead in the best of 5 series with game 4 being tonight in High1’s arena.The other semifinal is an all Japan affair with bitter rivals Oji Paper Eagles who finished 2nd and Nippon Paper Cranes who finished 3rd,the Cranes presently lead the series 2-1 with game 4 tonight in Kushiro home of the Cranes. So the final will feature a Korean team versus a Japanese team for the first time in Asia League history. I will give a brief rundown of an Asia League game I went to last month between Tohoku Free Blades and the Nikko Icebucks.It was one of the last games of the season which were played at the Higashi Fushimi Arena in Tokyo.It was a 5-2 win for the Free Blades with #81 Okuyama being the offensive star of the game with 2 goals and an assist and the goalie of the Free Blades Hashimoto who ironically enough was the number 1 goalie for the Ice Bucks last season making 41 saves for the win.Here is a pic of him and his teammates before the game. Let’s move onto the Bruins report,well the big news has been the loss of Marc Savard for the season due to a cheapshot from Matt Cooke of the Penguins,however judgement day is on March 18th where the Bruins will get their revenge against the cheapshot artist Cooke at home versus the Penguins.The Bruins are fighting for their playoff lives as they presently sit in 8th spot 3 points ahead of the New York Rangers after a huge win tonight against the Carolina Hurricanes where they scored 5 goals in a rare offensive outburst for them. 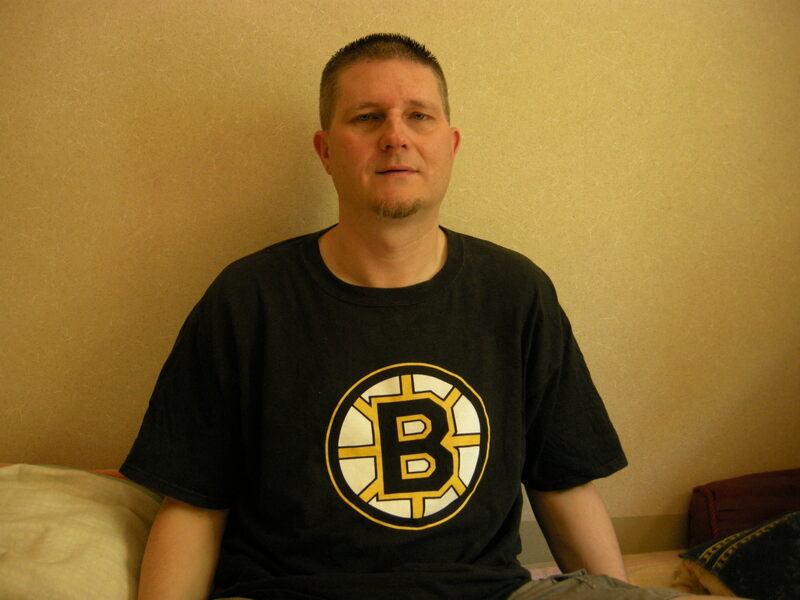 My friend Beau is a huge Rangers fan so I hope the Bruins can beat the Blueshirts for the last playoff spot. Hockey pool update Patrick the rookie has all but wrapped up first place with about 3 weeks left in the season he has 892 points,Johnny boy who has never won the pool in second with 846,Papa Rog in third with 795,Jay the minister in 4th with 762,me in 5th with 750 and Brian the sophomore in last with 737.I still have hope that I can pass Jay and get into 4th but with a goalie who isn’t even the starting goalie on his team it will be hard. Finally the Yahoo fantasy update,it is pretty ugly for me I am in 5th place out of 6 teams.Johnny boy is in first with 43.5 points and it looks like he will win it.Jeff from Spruce Grove in second with 36.5 points,arrogant Dave from Calgary with 34,5 points in 3rd,Thomas in 4th with 32,5 points,me in 5th with 30 points and Kevin from Toronto in last place with 12 points with his worst showing in the Slapshot Tokyo fantasy pool ever!!! 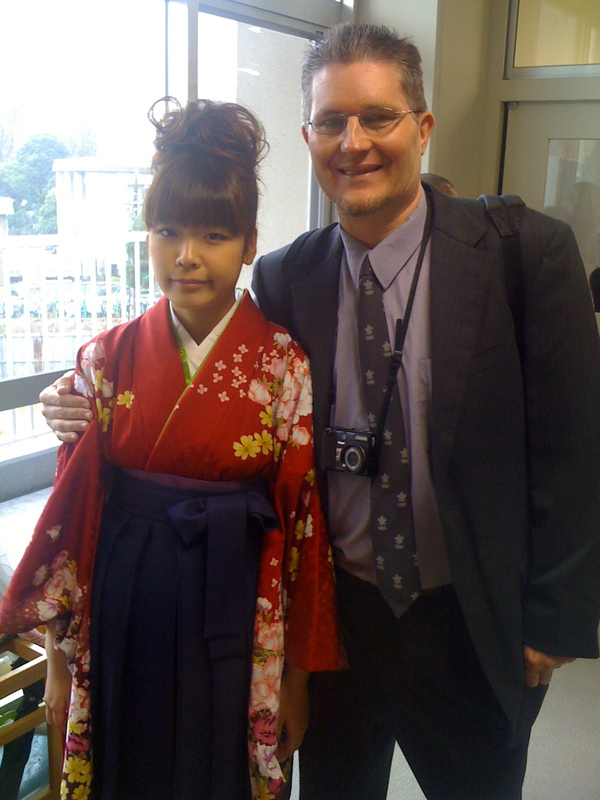 One more thing before I sign off,my oldest niece in Japan Yu graduated from high school this month and we are taking her to Hawaii this week for 4 days as a graduation present.Here is a picture of me and her at her graduation ceremony. China Dragon win a game in the Asia League!!!! Hey Hockey fans I decided to do a post on my birthday which I share with my mother who unfortunately passed away 9 years ago so I dedicate this blog post to her. First let us get into the Asia League,I did manage to get out to a game 2 weeks ago where I watched the Nikko Icebucks beat the Nippon Paper Cranes 4-2 ,the star of the game was Kikuchi the Icebucks goalkeeper,the Icebucks powerplay was pretty good in this game,they scored 4 goals in the second period to put the game away.Here is a pick of #39 Kikuchi the Nikko goalie. The Cranes powerplay was terrible they must have had about 7 powerplays and did not get a powerplay marker.They do have a new Canadian defenceman named Pierre-Olivier Beaulieu #55 who played okay and he managed to hit a few guys in a very low hitting game as most Asia league games are.Here is a picture of him in the game. Let us take a look at the standings and see that the China Dragon won a game against the Nikko Icebucks to break their 0 and 19 losing streak,they lost one more game to start the season than the NJ Nets in the NBA who lost 18 in a row,however the China Dragon lost the next 2 so they are a brutal 1 and 20 after 21 games.At the top of the league,the Oji Eagles from Hokkaido and Anyang Halla from Korea are tied with 45 points after 21 games,the Nippon Paper Cranes have 44 points after 23 games,High1 from Korea are next with 40 points after 23 games ,the Nikko Icebucks are after them with 32 points,the Tohoku Freeblades have 19 points and the China Dragon are in the basement with 3 points.I might go to a game in Aomori to see the Tohoku Freeblades battle the Nippon Paper Cranes and experience some real winter weather in the northern part of Japan. Boston Bruins report is next,good news and bad news,last Friday was really bad as the Bruins lost to the Hab scum in Montreal 5-1 on a special 100th anniversary game,I believe the Bruins were thinking one night ahead to the big game against the Toronto Maple Laffs and the return of Phil Kessel to Beantown.This game was a great massacre of the Maple Laffs,7-2 for the Bruins with Marc Savard getting a hattrick and Kessel the glory boy being -3 and pointless on the night.Tuuka Rask continues to play well for the Bruins and got the win against the Maple Laffs after he had mopup duty in the third period against the Habs the night before where he allowed no goals.Injury news Milan Lucic is out of the lineup again,I really hope he can get back and help the team soon.As for the Northeast division the Bruins are in first 1 point ahead of the Sabres who they are battling for the third seed in the Eastern conference. Yahoo fantasy update,I am presently in fourth as my team is having problems scoring and racking up powerplay points and my team plus minus is abysmal and falling fast.Spruce Grove Jeff is in first after pulling off a blockbuster trade with me,I sent him Sidney Crosby and Dennis Wideman and he gave me Marc Savard,Dustin Penner and Dan Boyle,early on he seems to have won the trade as Crosby has been on fire since I traded him.Arrogant Dave from Calgary is in second,Johnny boy from Vancouver in 3rd,Thomas in 5th and Kevin from Toronto is in last place just like his Leafs in the Northeast division,I have to say I am enjoying seeing Kev in last place every day. Finally the main pool,Johnny boy is in first place with 348 points,I am in second with 339,Patrick the rookie is in 3rd with 338.Papa Rog in fourth with 331,Brian the sophomore in 5th with 315 and Jay the minister in last with 312.The pool is turning out to be a great 4 way race with only about 2o points separating 1st from 4th.I finally made my first trade dropping Setoguchi and taking Kessel.Jay has used all his trades so he is out of the running this year I am afraid. Have a good holiday season all if I don’t get a chance to write another post this year. Asia league on a 2 week break!!! 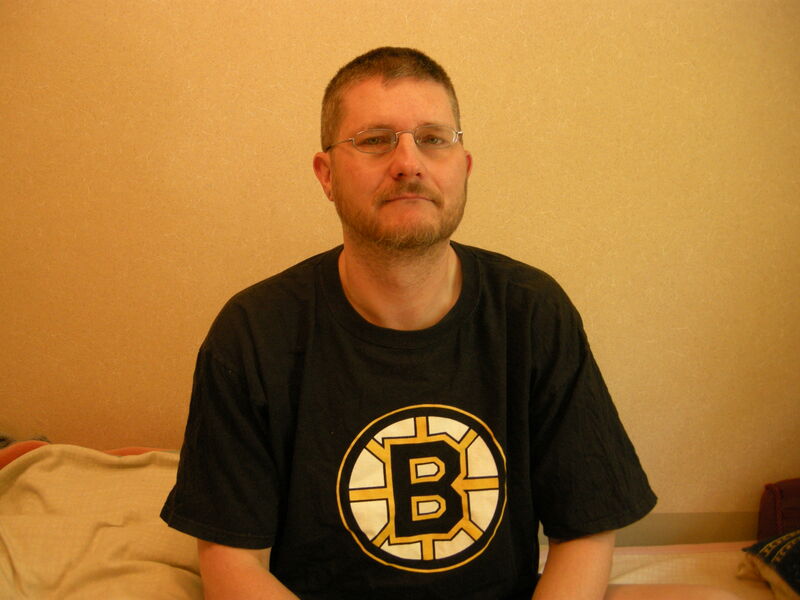 Hello Hockey fans I am back after a long hiatus and ready to give you some insight into the Asia league,the Boston Bruins,fantasy hockey and our hockey pool. Let us look at the Asia league first,The Nippon Paper Cranes are tied for first place with 30 points with Anyang Halla from Korea and Oji Paper is in 3rd with 26 points,all these teams having played 12 games. High1 from Korea which has the two leading scorers Alex Kim and Tim Smith is in fourth with 25 points but they have played 15 games,the Nikko Ice Bucks are in fifth,the Tohoku Freeblades the newest team in the league has 13 points and in last place the China Dragon with 0 points and no wins after 15 games.The Dragon have a Japanese goalie and he has been peppered with pucks every game as they could go winless for the whole season.I hope to get to some games this weekend in Yokohama as there will be four games played on Saturday and Sunday by the four Japanese teams.Pictures to follow in the next blog post. 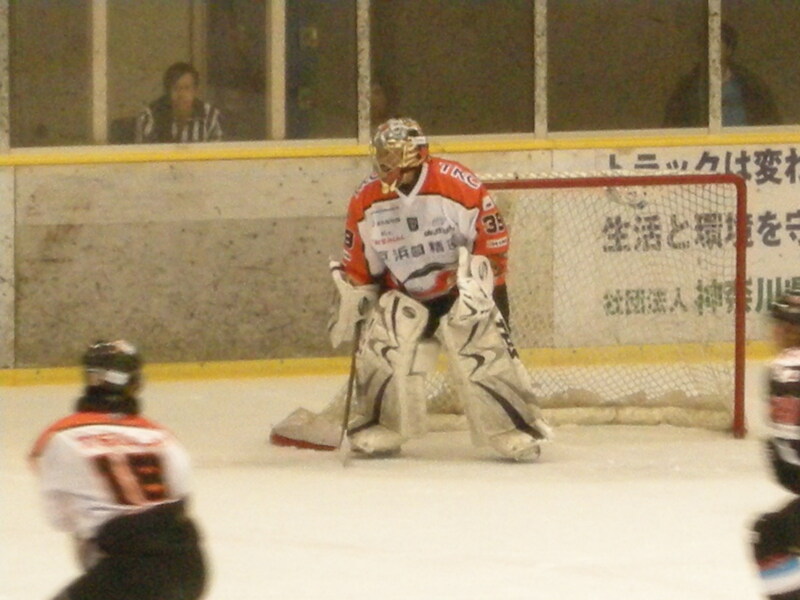 Here is a picture of Chris Yule from last year he presently has 6 goals and 5 assists for the Nippon Paper Cranes in 12 games this season,he was born in Edmonton,but has become a naturalized Japanese citizen and has played for the Japanese national team at the Nagano Olympics and other international tournaments. On to the Bruins they have made it back to .500 hockey with a great 4-2 win over the Northeast leading Buffalo Sabres last Saturday which I watched on NHL Gamecenter with much hooting and hollering from 9-12 in the morning,however they are not in the playoffs at the moment due to having some injury problems right now as their leading scorer Marc Savard is on the shelf for 4-6 weeks.The other injury is to Milan Lucic the reincarnation of Bruins legend Cam Neely who broke his finger and is out for 4-6 weeks as well.Tuuka Rask the backup goalie for the Bruins is playing well and got the win for the Bs on Saturday.Here is a picture from 2006 of the Finnish Junior team of which Rask was a member in downtown Vancouver during the World Junior Championships which Canada won of course. Next on to Yahoo Fantasy Hockey,I am in first place as all my players have been scoring and racking up the penalty minutes.My 3 goalies are Tim Thomas,Steve Mason and Evgeni Nabokov.Thomas and Mason have been below average so far but Nabokov has been stellar.Arrogant Dave is in second and his players have been heading to the injury list in droves.Spruce Grove Jeff my fraternity brother is in third and has been trash talking me quite a bit.Johnny boy from Vancouver in 4th with Luongo on the injured list,Kevin from Toronto in fifth and Thomas in last.The lack of players is disappointing but oh well lots of players available on the waiver wire. In the main pool,Patrick the newcomer is in first,but the beginners luck should wear out soon,Johnny boy in second,Jay the minister in third,me in fourth,Papa Rog in fifth and Brian the sophomore in last.I have 3 players on the injured list Briere,Toews and Setoguchi and am contemplating making my first trade.It is rare for me to have not pulled the trigger on a trade by now as all other poolies have made at least one trade.This strategy could pay off for me in 2010 when I will be able to bolster my team for the stretch run in march and April. One last thing before I go,my Dad will probably kill me for posting this picture but here is a pic of the oldtimer who just celebrated his 66th birthday on November 5 some time in the 1970s in the dressing room for his army team. See you soon and enjoy the hockey wherever you are!!!!! Hockey is back and so am I!!! Hi hockey fans the summer is over and hockey is back,I went back to Calgary and Vancouver in July for 10 days and the only sort of hockey pic I have is Ron Maclean at the Calgary Stampede giving out some awards on the last day of the rodeo. The Asia league is already 2 weeks into the season and the Oji Eagles are in first place but they have played 5 games so that is more than most of the other teams.A new team has joined the league called the Tohoku Freeblades a team from the northern part of Japan who will play games in Fukushima and Aomori prefectures,they did manage to win their first game of the season yesterday against the Nikko Icebucks in Nikko.I might go see a game next weekend in Nikko as the Icebucks will play the China Dragon,the new Chinese team which is based in Shanghai,they were the China Sharks last year but it looks like the San Jose Sharks have pulled their affiliation with the Chinese team.They have 2 foreigners on the China Dragon one German and one Russian.The Seibu Prince Rabbits folding last season sent some players to the Icebucks Eagles and Cranes and the new coach of the Freeblades is the old Seibu coach.More info to come in my next post next I will move onto the pool and NHL reports. The main pool will be held this Sunday at 630pm and we have 5 confirmed participants Jay the minister Johnny boy Papa Rog back after a 1 year absence and Joey the golden boy of finance and me.If you would like to join us please email or call me 13 players and 1 goalie with 3 trades.Players get 1 point for goals and assists as do goalies and goalies get 1 point for a win and 2 for a shutout. As for the yahoo fantasy this is where we have a problem only 4 players so far but interest from Brian the sophomore and Jeff from Spruce Grove and a fellow Bruins fan.I hope we can keep this pool alive because it has been going on for 9 years so I will be very disappointed if it doesn’t go ahead.If you are interested the pool name is below and the password will be supplied if you want to join. The Bruins report well the season starts in 3 days and the GM traded Phil Kessel to the Toronto Maple Leafs for 2 first round picks and a second round pick.I really like this trade it reminds me how we ripped off the Leafs in the Raycroft -Raask trade,speaking of Tuuka Raask he will be the backup goalie for the Bs this year and he has an NHL record of 1 win a shutout and 100% save percentage from last year but in only 1 game.Marco Sturm should pick up the scoring slack left behind because of the loss of Kessel. Well thats all for now hockey fans see you soon and enjoy the opening games of the NHL season this week!!!! hey everyone going to Calgary in 10 days I hope I can meet up with some of you there!!! waiting for the iphone 3.0 update it is June 17th in japan I want my copy and paste already!! !